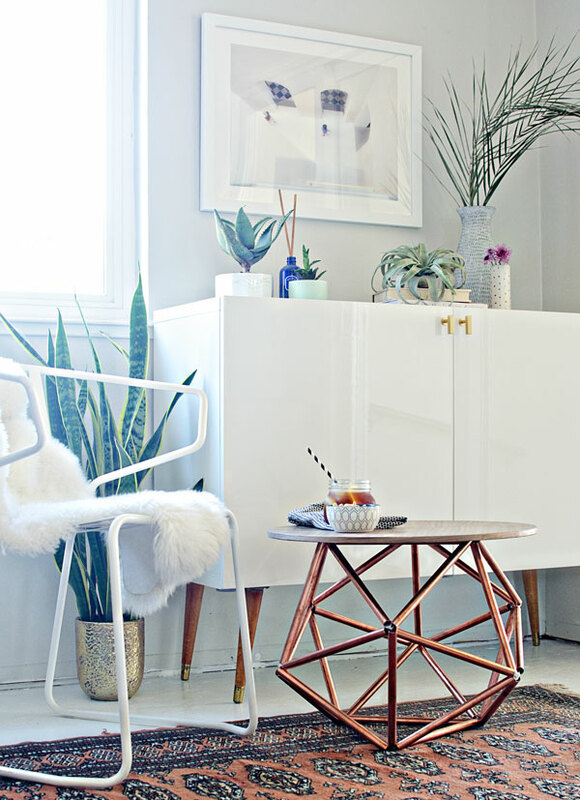 Fancy is always an amazing theme to abide by when it comes to decorating your own place, right? The definition of fancy is to make things look impressive and quite extravagant as soon as you lay your eyes on, but the ugly truth is that everything that is fancy is actually expensive and may not be affordable for everyone; and yes, you are right; this is so not fair because it does not make sense that wanting to make the place where you stay most of the time fancy can cost you a fortune that might as well mess up your whole budget. In that case, you may need to sacrifice your essential needs until you are capable of getting the decorative materials that you seek. Well, this is quite frustrating, but here is the breaking news; you do not have to spend fat bucks or destroy your budget in order to have the house of your dreams; all you actually need is to have time on your hands as well as a readiness for getting creative and artistic. You have probably gotten what we are trying to say here, but if you are still not sure how the spare time and creativity are going to get you the fancy house you want, we will just have to speak it out loud: DIY home décor ideas. Thanks to the internet, you are now capable of borrowing nice ideas for beautifying your own house while staying within your budget because, most of the time, you use materials that you already own or buy some that are quite affordable and available at the local stores. If you are looking for simple ways with which you can fancy your home up, check out this list of 8 DIY decor ideas we carefully picked up for you. If you would like to add dim lights to your living room or bedroom without them looking cheap, then this creative idea will work perfectly for you. 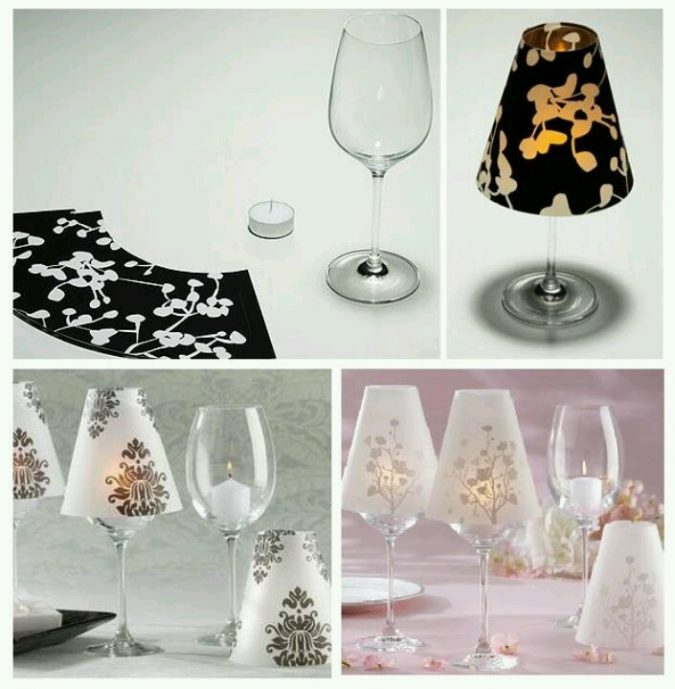 Grab several champagne glasses that you do not need along with patterned scrapbook papers and small candles. 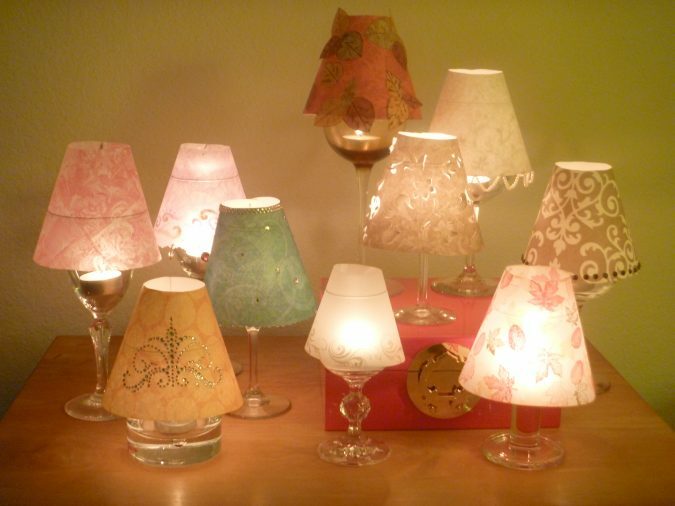 Wrap the patterned paper around the rounded part of the glass, covering it and place the lit candle inside of the cup. Here you go, now you have a small light bulb that can add a nice dim light to your room and also looks fancy. Laces are amazing for beautifying anything they are added to, so if you have a plenty of them that are left unused, grab all of them and take advantage of creating a vintage, elegant atmosphere to your place. 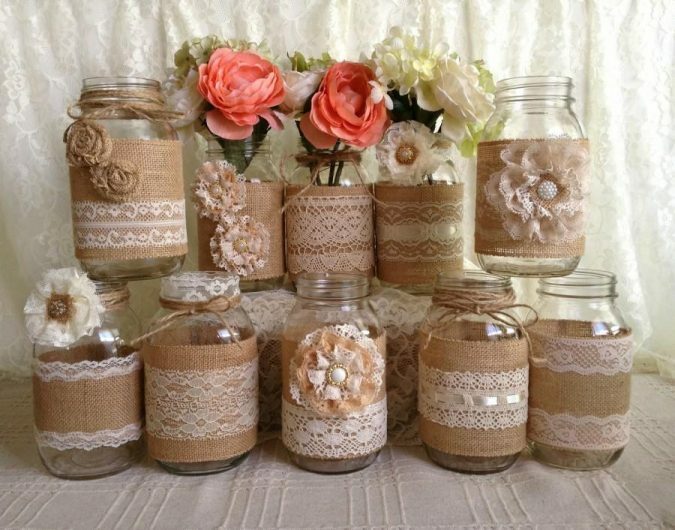 Get those unused pieces of lace along with old jars that you no longer need and apply glue or any adhesive material to the outer part of the jar. Stick the lace to the jar and let it dry, then you can wrap some adorable ribbons at the top part of the jar near the opening. It is up to you whether you want to leave the jars that way or you would love to add something to it. If the latter is your case, then adding some candles inside or beautiful flowers will go a long way. 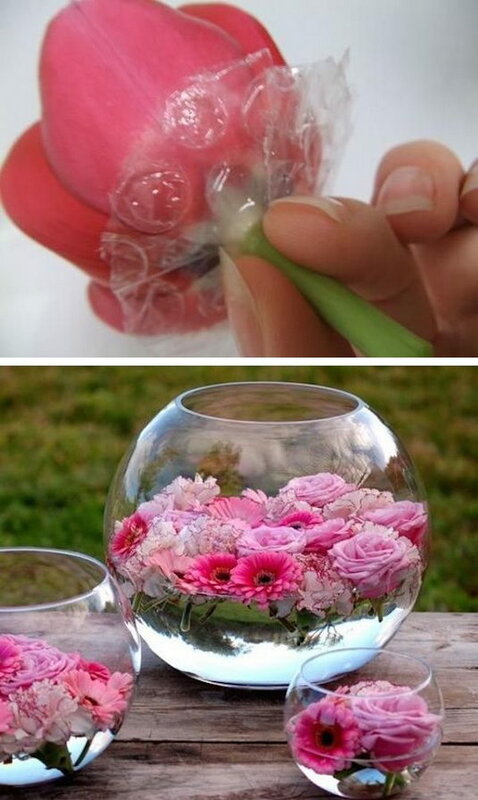 This is another way to add some fancy decorations to your house; the floating flowers. It is quite easy and simple to get it done; all you need is to get a rounded empty glass tank and pour some water into it, but do not fill the whole thing; just about ¼ of it will be perfect. 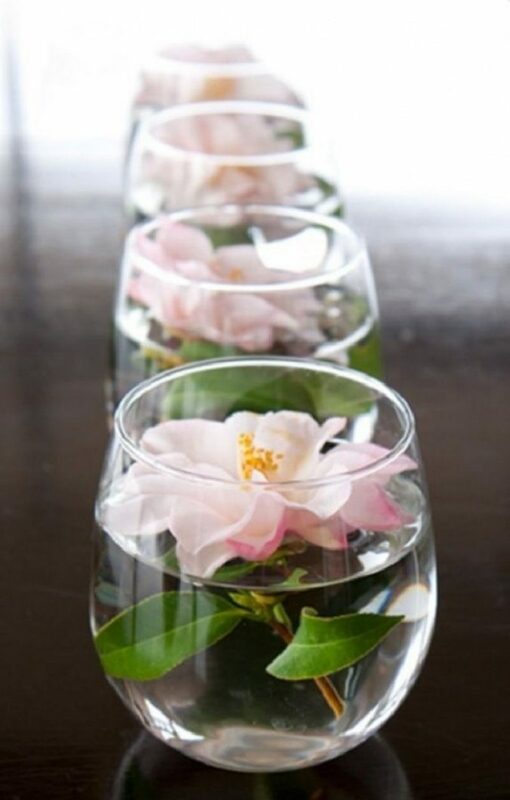 Of course, if you added the flowers immediately, they will get wet and you will not get what you are looking for, so here is a simple solution to save these poor flowers; add bubble wraps at the very beginning of the flowers’ stems; this way it will not soak into the water. 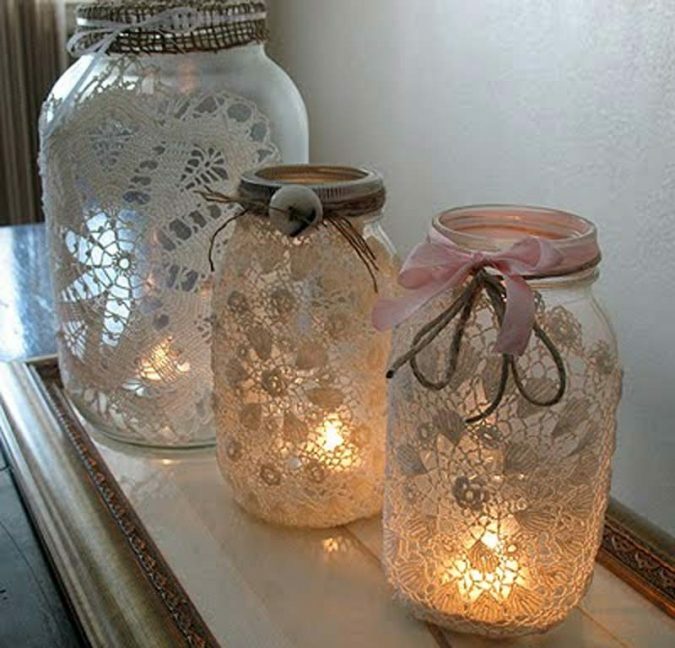 Place your decorated jar somewhere where it can be visible and let it add a nice atmosphere to your place. This mini version of lamps has gone viral ever since it came into appearance; you can either create one on your own or purchase one, and do not worry it is quite affordable. 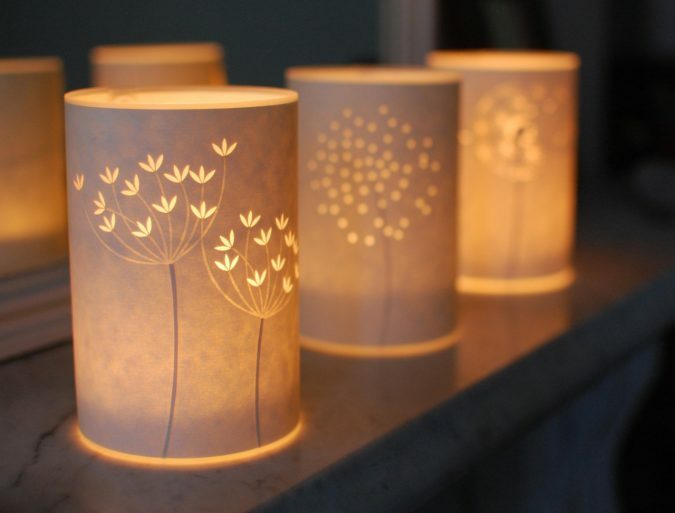 It is made out of paper that is precisely cut by laser and it is coated in order to be strong and last; it is also relatively small in size wherein a tealight candle is placed inside a glass votive, making it safe to be used. 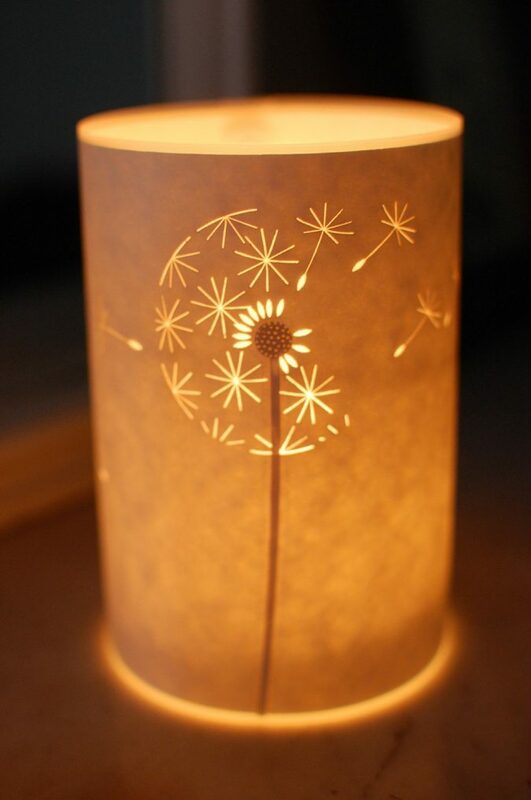 This fancy looking small fennel candle light will make your room shine in the most beautiful way ever. If you have a small pot of plants, you can give them a new home; consequently, their home will give yours a new decoration. 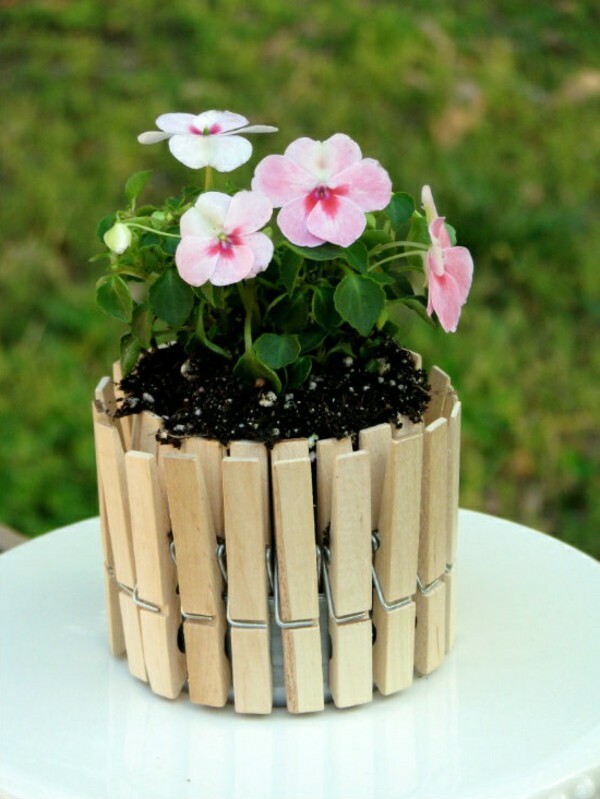 Getting this done is as easy and simple as ever; all that you have to do is get an old can, like the tuna cans, and make sure it is cleaned thoroughly, then get a set of old laundry clips that you do not need and start attach them all around the can and place your plant pot inside of it. 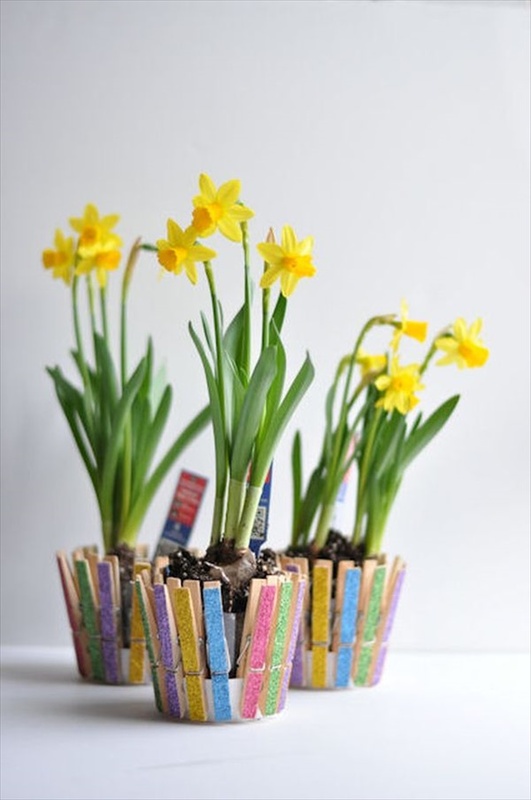 You can make several ones of them and place them on your dining table, or even make just one and place on the center table of your living room. 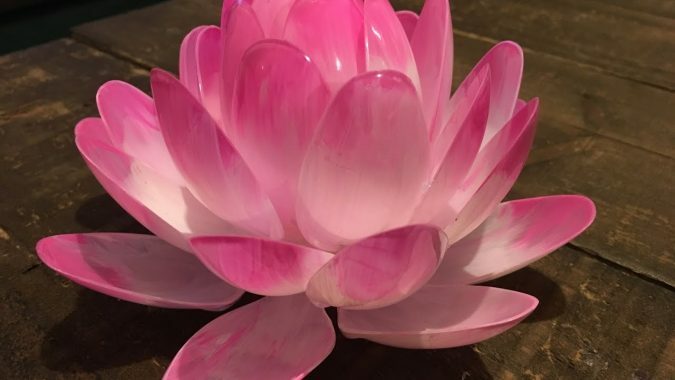 To create such beautiful masterpiece which you can add to the nightstand by your bedroom, you will only need plastic disposable spoons as well as cups, but make sure the cups are transparent,]; you will also need a pair of scissors along with glue. 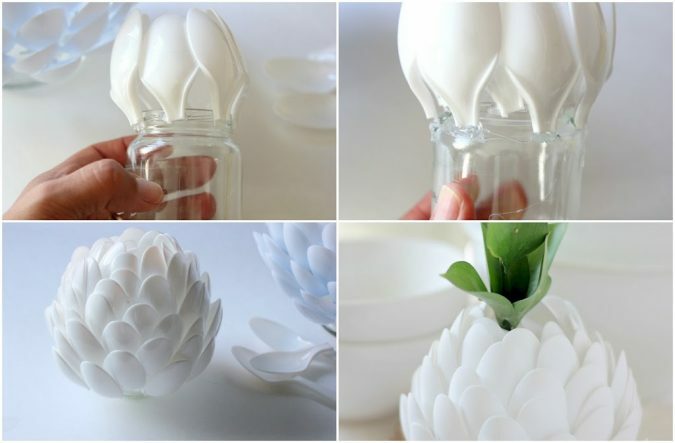 Now, cut out the tips of the spoons in order to use them as petals and stick them to the plastic cup using glue; starting from the top inside of the cup, and working all the way down to the bottom. 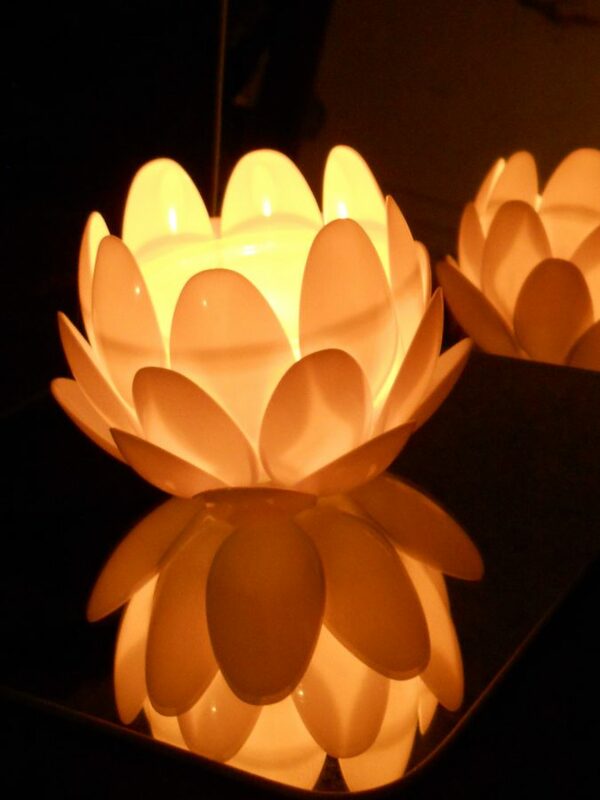 At the end, you will have a beautiful flower accessory that you can place in your bedroom. If you want to have it as a chandelier, add a votive candle inside the cup, and there you go. In order to create such an impressive table, you will have to get all of the following supplies; walnut veneer plywood, pipe cutter, clear polypropylene thread, edge banding tape, copper pipe rods as well as hangers, crème wax, waxing brush, sander, and finally, lint-free cloths. The first step is creating the Himmeli base; you will need to cut the copper pipe into thirty pieces where each is ten inches long, then cut about ten feet of the thread’s whole length. Now, string the first three tubes together, creating a shape of a triangle, and make sure to pull the threads tightly and tie a knot at the end of each triangle, so the shape won’t get loose. Then, you should create the top of the table by measuring out a perfect circle on the veneer plywood and cutting it out using a jigsaw. After cutting out the circle, apply some clear wax to the two sides of it as it works as a protecting coat, and wait until it dries. 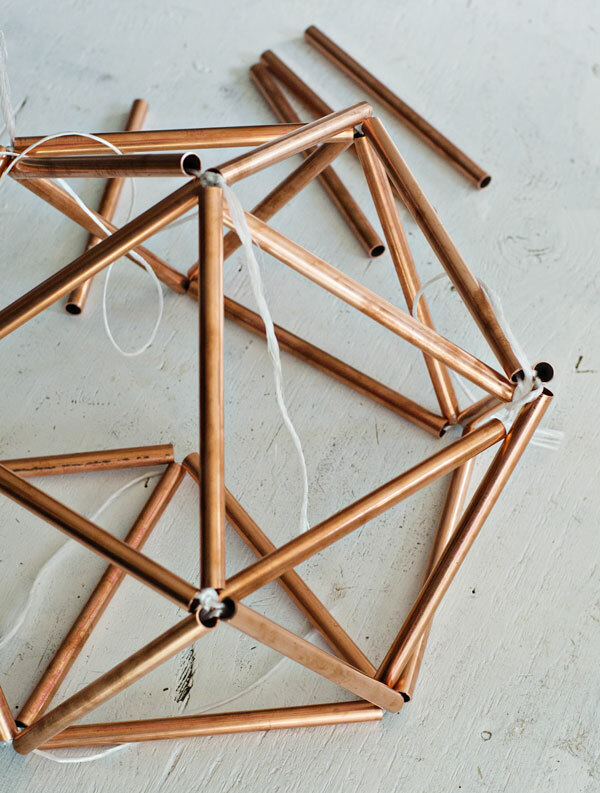 Once the drying process is over, start securing the himmeli base using the copper pipe hangers and here you go, you can now have a fancy side table that is made up totally by you. Hanging stuff is always fun, be them a bed, hammock, chair, or anything, right? Well, if you agree with this, then you should decorate your own living room, or porch, with an easy hanging lounge chair; Here is the easiest and simplest way possible. What you are going to need are: three 1.25 inches oak dowels and another two that are 5/8 inches, rope, canvas drop cloth, drill, sewing machine, a pair of scissors, and a tape measure. You can also get a stain, but this one is optional. 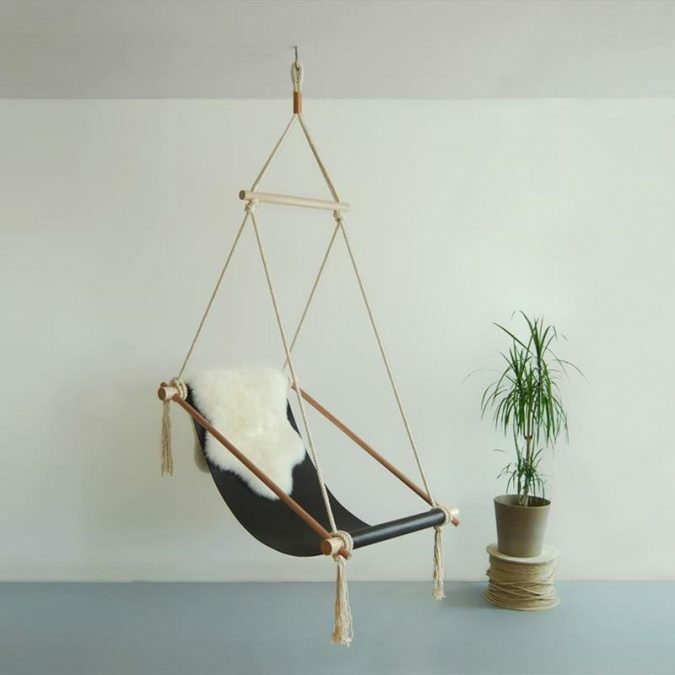 Once you get all of these supplies, you are almost ready to start creating your own hanging chair. First, you will need to cut each dowel, the 1.25-inch ones into 30 inches long. Two of these dowels will be for the seat part of the swing, so measure 2 inches with 3.5 inches at each end, but make sure you mark them correctly so they are all at the same level. Now, drill a 5/8 inch hole through the two inches marks on each dowel and another ½ inch hole through the other marks, the 3.5 inches. Once you are done drilling, start cutting out the piece of the drop cloth into 48″ and 23″; then take the long sides, fold them into half of fabric and iron them while they are in place, then fold again and iron and repeat the same process for the opposite side. Along these two folds, start sewing twice then fold both the bottom and the top, and sew across the bottom one then slide the dowels that are 1.25 inches into the two ends of the canvas seat, and then use the hole you drilled earlier for placing the 5/8 inches dowels. Now, start sewing the dowels together and then tie a double knot on the rope and adjust its length according to the place you will be hanging the chair in. 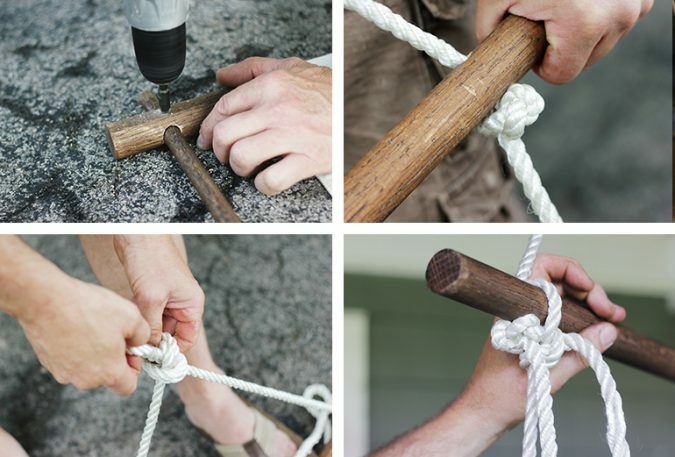 and trim the excess rope. Now that everything is ready, start hanging a hook that would be able to support at least 140 kilograms. Fancy furniture and decorations can be expensive to a lot of people. Nevertheless, you can still get all the decoration ideas you want without having to spend a lot of money; just use your spare time in creating one of these fancy ideas and enjoy your new looking home.